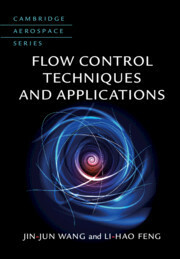 Providing comprehensive coverage, this is the first book to systematically introduce different flow control techniques. With a dedicated chapter for each technique, all of the most important, typical and up-to-date methods are discussed, including the vortex generator, biological techniques, the jet and synthetic jet, the plasma actuator, and closed-loop control. Understand their key characteristics and control mechanisms, and learn about their applications in different fields such as aviation and aerospace, mechanical engineering, and building construction. The necessary background on flow control is provided, including the history of the discipline, and the definition, classification and development of each technique, making this essential reading for graduate students, researchers and engineers working in the field. 1. Introduction; 2. Gurney flap; 3. Vortex generator; 4. Roughness; 5. Polymer; 6. Biological techniques; 7. Jet; 8. Synthetic jet; 9. Plasma actuator; 10. Lorentz force; 11. Closed-loop control. Jin-Jun Wang is the Director of the Institute of Fluid Mechanics at Beijing University of Aeronautics and Astronautics (BUAA), and the Director of the Fluid Mechanics Key Laboratory at the Ministry of Education of China. He was the Head of the Department of Aircraft Design and Applied Mechanics at BUAA between 1997 and 2003. Li-Hao Feng is an Associate Professor at Beijing University of Aeronautics and Astronautics (BUAA), and an editorial board member of the Journal of Flow Control, Measurement & Visualization.